\nThis is a quote from Chinese military strategist Sun Tzu in the Art of War. This is probably one of the first mentions of the fundamentals behind benchmarking theory in the written history of man. Sun Tzu wrote this treatise some 2400 years ago. Applying this quote to the current Jamaican Football Industry exposes one of the inherent weaknesses of our football culture; that is the lack of internal and external benchmarking of football practice and culture. We neither know who we are nor do we know our competition as we are not consistently measuring ourselves on core criteria that the other leagues do nor are we looking at how others perform in these key statistics. If we don’t set the standard based on benchmarking the best both internally and externally we will forever be “at risk” in the heat of competition. In our case the competition is the FIFA world cup qualifying and Concacaf club championship competition. \nThe one area that this article will focus on is the gathering and dissemination of performance statistics equivalent to what other top leagues such as La Liga, EPL, Serie A as well as other top second tier leagues like the Championship and MLS that consistently gather and publish fundamental information on a weekly basis on what the players have done in each new round of competition. This creates the basis for measurement of performance and benchmarking that drives improvement on every level. \nSimple statistics such as assists, games played per player, minutes played within the league season by player, shots taken and shots on goal are all missing from the top Jamaican league the RSPL. What is necessary is a weekly cumulative update on this information so players know exactly where they stand. If the players are not driven by competition then shame is also a good motivating factor when performance of duty is measured and the information disseminated to all relevant parties. Thus currently our players, technical managers, club administrators, fans and other interested partieshave no opportunity to measure player performance and development through the season in key performance areas. Performance measurements in Track and field and Cricket are a fundamental part of the selection process; the times and scores for every track meet and cricket match held in Jamaica are typically readily available and well understood throughout the greater sports community in Jamaica, this certainly is not the case in football. \n1. These rankings are based on the main everyday job that players have, that of the their club’s participation in their main league competition, it does not look at other games or other cup competitions, thus players in clubs within the EPL, the statistics are strictly for those games that constitute the EPL season, no FA cup games, or other type of games are included. \na. This levels the playing field for all the clubs across the various leagues. \nb. Levels the playing field for all players within the club. \nThe players’ main job is to play as much as possible in all league games. Consistently making the first eleven or at the very least being in the active substitute rotation. The only way to do that is being productive with each opportunity that the player receives when he makes it onto the field in a league match. These are the main criteria points that the players are measured on when compensation and contract negotiations come around, consistency, productivity and durability. \n2. Injury time is not backed out in the assessment of player participation one of the subcategories of the ranking, the players jobs is to be indispensable to the team and a wounded warrior cannot impact the battle on the field even though he is paid while he is wounded. Durability is a highly desired trait in this ranking, thus a player like Rudolph “Ruddy” Austin who was out for a few games at SK Brann this season, his bottom line number would be somewhat affected by missing those games but there are many other performance measurement areas that also impact on the overall ranking. \n3. The players in the ranking do not constitute a comprehensive list of all players that are eligible to represent Jamaica however this list is quite wide and covers a lot of ground in that respect. \n4. Data in this ranking covers the 2011-12 season and or the 2012 season, the data end point is 8.30.2012. The data from the start of the English and some European seasons since August 2012 are not included in these statistics as those have just started in the past two weeks. Also all European competition except those wholly in 2012 like the Norwegian Tippeliagen as well as the US MLS are not included in this ranking. \n5. No goal keeper information is in this first issue of the ranking. \n6. Inadequate data on certain players has led to the omission of some of their data from the ranking, thus is the case of both Errol Stevens and Kavin Bryan and their stint in Vietnam. The one exception was Jeremy Lynch where I was able to combine the data from the RSPL and the U21 games with the RSPL total season as the denominator to get one score. His information was the only under 21 player where most of the core information was available. \n7. Certain assumptions had to be made on the Jamaican players to get a final score and rank due to the inadequate measurement and dissemination of performance data, many to the detriment of local players such as Jermaine Anderson, Michael Campbell and Jermaine Hue. In each case I am certain that these players had more than one assist in the games played in the RSPL season and they probably also played more games than the given credit within the base assumption where the data was unavailable. Therefore with no hard information in the assist area, their performance in this area show no assists, so in that category they receive no score. Information on games played and minutes played also led to assumptions driven more by the average of the total table outside the RSPL, thus all RSPL players without games played, assists, minutes played and shot accuracy information will all be filled with data at the 75% performance level of the average of the entire group, except in the case of minutes played per game where a higher number is issued that the average of 73.35 minutes per game for the non –RSPL group based on the data. All assumptions made are consistent across leagues and players from an impact standpoint and are highlighted in white blocks in the tables. \n8. Assumptions also had to be made on shots taken and shots on goal numbers for other second tier Eurasian leagues like the Norwegian Tippeliagen, the Finnish Veikkausliga and the Turkish Super Lig, the same assumptions hold sway as were made for the RSPL as well basically a 25% shot on goal ratio versus shots taken. \n9. Acronyms and abbreviations in the table; MPG-minutes per game, YC & RC yellow and red cards, GDR- goal differential ratio that is goals for divided by goals against, TS – Total shots taken, SOG – shots on goal, W,L,D means team wins, losses and draws for the season or season to date. The colours in the table basically break each position group into three ranks. That is top tier in green, middle tier in yellow and bottom tier in orange. \n10. Look at the article “Raising the Bar III” in the Reggae Boyz Supporterz football forum for more discussion on assumptions across the leagues and other points where there may be questions. \nNB: Your feedback is greatly appreciated and your comments shall be an important input on review taken before the next publication is undertaken. \nWhat has been learned from this process is we truly have some fundamental flaws that need to be addressed immediately if our hope is that Jamaica can be a consistent player at FIFA world cups and in Concacaf, our local leagues have to step up to the plate like MLS in the USA has stepped to the plate in the development of information collection and dissemination. \nThe MLS website is excellent and truly allows the players,technical managers, administrators, clubs seeking players, players agents and other interested parties to see exactly where the players stand on each and every statistic that is measured in the EPL and other leagues of that ilk. \nWhat we actually see when we look at the data is that even in the MLS not to mention the RSPL our best players are not even close to the performance based on statistics that the top players in La Liga, EPL, Bundesliga, Serie A produce. In those leagues we see a consistent trend of top players in the striker and midfielder position having a high strike rate of goal producing event (GPE) with each game when measured over an entire season, whether assists or goals or combination thereof, at one GPE per game throughout the entire season. \nLooking at number of games played relative to number of games played in the league for the season, top players like Messi, Ronaldo and Evra each representing the three position types are playing if not every game they miss only one game for the entire season, of our 64 players in this sample only Obrien Woodbine and Jason Morrison are at that level of durability and Joel Senior at the local level with 36 of 38 games played in the RSPL (Senior being the most complete data available at the RSPL level). Thus the most critical piece of being able to play at the professional level; the commitment to the job showing up every day and playing full minutes seems to be missing in the local game. It is not even measured, I am sure many of our star players are probably rested for key games thus when they get to the real professional leagues they have not developed the mental work habits to play every single game at a high level, they have not developed the desire and mental skills necessary to convince all pertinent parties that they must be on the field at all times in all games as that is what is required for the team to win. At professional clubs where the “star player cushy treatment is missing for our players”, this means they must rapidly adapt and adjust in order to exert the necessary physical and mental effort in practice and in games and strengthen their desire and will to convince all parties, players, coaches, managers that they must play for the success of the team. \nThe goal differential ratio in the big leagues for the best team suggest that we are not even playing the same game in the second tier and third tier leagues relative to the EPL, La Liga and Serie A, looking at the first and second place teams like Barcelona, Real Madrid, Manchester United, Manchester City in the top leagues all these teams have “high goals for” number versus very low “goals against” number which results in a significant goal differential ratios while for roughly the same number of games MLS, RSPL etcetera the numbers of goals scored for versus against and the GDR ratios are very low for the top teams in these leagues. \nOur best local player in the RSPL is scoring at a GPE of .36 per game, while Messi is scoring at 1.75 GPE’s per game, Ronaldo at 1.57 per game, Van Persie at 1.01 per game and they are playing against the best competition week in and week out and not missing games. Top local teams should be producing forwards and midfielders that can produce at that rate or strive to get above .50 GPE for the best players in what is a third tier non-professional league, but they have never either had such an expectation set or measured themselves in this way or benchmarked other leagues to see what it takes at that top level to really succeed. Thus we see our “great” talent barely making the grade in second tier leagues and very few making it as solid contributors in top tier leagues as the necessary knowledge of performance required to thrive or in this case merely to survive in these leagues has not been cultivated in our local leagues and thus is totally missing when our players arrive and need to survive in a professional setup. \nHere is the opportunity to raise the bar in one area, that is collection of data and measurement of performance so RSPL players can truly understand what they are doing and measure themselves somewhat against the competition, basically creating a more level playing field so all aspirants can feel, “if I perform at this level then I must get called for national duty or at least attract the attention of a professional team scout” otherwise we are destroying the very base of the system we are trying to build. Some people think the RSPL is not relevant, but it is probably the best thing we have got going in local football so we must make every effort to build it as much as possible as it is the battleground to develop and improve the football industry for export of players which should be our goal for the foreseeable future as we cannot sustain a true professional league when per capita is income is less than $5000.00 US per person. \nIt is nice to see certain young players getting called for national duty but the bottom line is they must produce in the local league on a consistent basis to get called. We would never see a situation where a sprinter like Dexter Lee would get called to represent Jamaica in the Olympics ahead of Ashmeade, Young or Weir who have produced and demonstrated superior results especially at critical times like at National Trials. The RSPL should be our National Trials for those players in Jamaica, those who rise to the top looking at productivity, durability and consistency should get picked, that levels the playing field for all and makes it clear what the standards are and what to play for. No matter how great anyone thinks his talent is, talent is great, but application of talent to produce results in competition should be the only standard. \nAt the end of the day we want all our players wherever they are to truly believe and strive for the following words by Longfellow. Rath.. rispec is due !! \r\nSummady need to fax dis tuh di JFF ASAP ! Excellent Stony!!!!! This collection of data required some level of commitment and you must be commended for your efforts. Mosiah, please forward this your friend the good Captain. playing TEAM in every match for FULL minutes. \nPresently the numbers suggest our players tune in and out of matches. As fact it would not be a stretch to say the numbers when compared with what holds in the top leagues...and what our eyes show with the play in matches of the other 2 teams - Croatia and Japan - from our 1998 World Cup Final group who were, as we had hoped we were, looking FORWARD to joining the world\'s top tier teams that their players have not rested...and do not rest on ground covered, passing, shooting, etc. \nThose 2 teams play everytime they take the field FULL MINUTES of TEAM!!! \nYour stats show our lack of application and if we consider the passing of time 1998 to present, some 12+ years, it would appear that our technical club & national staff are ignorant of \'real work(load)\' of their players and what should hold (in their workplace). \r\nThis is a quote from Chinese military strategist Sun Tzu in the Art of War. This is probably one of the first mentions of the fundamentals behind benchmarking theory in the written history of man. Sun Tzu wrote this treatise some 2400 years ago. Applying this quote to the current Jamaican Football Industry exposes one of the inherent weaknesses of our football culture; that is the lack of internal and external benchmarking of football practice and culture. We neither know who we are nor do we know our competition as we are not consistently measuring ourselves on core criteria that the other leagues do nor are we looking at how others perform in these key statistics. If we don’t set the standard based on benchmarking the best both internally and externally we will forever be “at risk” in the heat of competition. In our case the competition is the FIFA world cup qualifying and Concacaf club championship competition. \r\nThe one area that this article will focus on is the gathering and dissemination of performance statistics equivalent to what other top leagues such as La Liga, EPL, Serie A as well as other top second tier leagues like the Championship and MLS that consistently gather and publish fundamental information on a weekly basis on what the players have done in each new round of competition. This creates the basis for measurement of performance and benchmarking that drives improvement on every level. \r\nSimple statistics such as assists, games played per player, minutes played within the league season by player, shots taken and shots on goal are all missing from the top Jamaican league the RSPL. What is necessary is a weekly cumulative update on this information so players know exactly where they stand. If the players are not driven by competition then shame is also a good motivating factor when performance of duty is measured and the information disseminated to all relevant parties. Thus currently our players, technical managers, club administrators, fans and other interested partieshave no opportunity to measure player performance and development through the season in key performance areas. Performance measurements in Track and field and Cricket are a fundamental part of the selection process; the times and scores for every track meet and cricket match held in Jamaica are typically readily available and well understood throughout the greater sports community in Jamaica, this certainly is not the case in football. \r\n1. These rankings are based on the main everyday job that players have, that of the their club’s participation in their main league competition, it does not look at other games or other cup competitions, thus players in clubs within the EPL, the statistics are strictly for those games that constitute the EPL season, no FA cup games, or other type of games are included. \r\na. This levels the playing field for all the clubs across the various leagues. \r\nb. Levels the playing field for all players within the club. \r\nThe players’ main job is to play as much as possible in all league games. Consistently making the first eleven or at the very least being in the active substitute rotation. The only way to do that is being productive with each opportunity that the player receives when he makes it onto the field in a league match. These are the main criteria points that the players are measured on when compensation and contract negotiations come around, consistency, productivity and durability. \r\n2. Injury time is not backed out in the assessment of player participation one of the subcategories of the ranking, the players jobs is to be indispensable to the team and a wounded warrior cannot impact the battle on the field even though he is paid while he is wounded. Durability is a highly desired trait in this ranking, thus a player like Rudolph “Ruddy” Austin who was out for a few games at SK Brann this season, his bottom line number would be somewhat affected by missing those games but there are many other performance measurement areas that also impact on the overall ranking. \r\n3. The players in the ranking do not constitute a comprehensive list of all players that are eligible to represent Jamaica however this list is quite wide and covers a lot of ground in that respect. \r\n4. Data in this ranking covers the 2011-12 season and or the 2012 season, the data end point is 8.30.2012. The data from the start of the English and some European seasons since August 2012 are not included in these statistics as those have just started in the past two weeks. Also all European competition except those wholly in 2012 like the Norwegian Tippeliagen as well as the US MLS are not included in this ranking. \r\n5. No goal keeper information is in this first issue of the ranking. \r\n6. Inadequate data on certain players has led to the omission of some of their data from the ranking, thus is the case of both Errol Stevens and Kavin Bryan and their stint in Vietnam. The one exception was Jeremy Lynch where I was able to combine the data from the RSPL and the U21 games with the RSPL total season as the denominator to get one score. His information was the only under 21 player where most of the core information was available. \r\n7. Certain assumptions had to be made on the Jamaican players to get a final score and rank due to the inadequate measurement and dissemination of performance data, many to the detriment of local players such as Jermaine Anderson, Michael Campbell and Jermaine Hue. In each case I am certain that these players had more than one assist in the games played in the RSPL season and they probably also played more games than the given credit within the base assumption where the data was unavailable. Therefore with no hard information in the assist area, their performance in this area show no assists, so in that category they receive no score. Information on games played and minutes played also led to assumptions driven more by the average of the total table outside the RSPL, thus all RSPL players without games played, assists, minutes played and shot accuracy information will all be filled with data at the 75% performance level of the average of the entire group, except in the case of minutes played per game where a higher number is issued that the average of 73.35 minutes per game for the non –RSPL group based on the data. All assumptions made are consistent across leagues and players from an impact standpoint and are highlighted in white blocks in the tables. \r\n8. Assumptions also had to be made on shots taken and shots on goal numbers for other second tier Eurasian leagues like the Norwegian Tippeliagen, the Finnish Veikkausliga and the Turkish Super Lig, the same assumptions hold sway as were made for the RSPL as well basically a 25% shot on goal ratio versus shots taken. \r\n9. Acronyms and abbreviations in the table; MPG-minutes per game, YC & RC yellow and red cards, GDR- goal differential ratio that is goals for divided by goals against, TS – Total shots taken, SOG – shots on goal, W,L,D means team wins, losses and draws for the season or season to date. The colours in the table basically break each position group into three ranks. That is top tier in green, middle tier in yellow and bottom tier in orange. \r\n10. Look at the article “Raising the Bar III” in the Reggae Boyz Supporterz football forum for more discussion on assumptions across the leagues and other points where there may be questions. \r\nNB: Your feedback is greatly appreciated and your comments shall be an important input on review taken before the next publication is undertaken. \r\nWhat has been learned from this process is we truly have some fundamental flaws that need to be addressed immediately if our hope is that Jamaica can be a consistent player at FIFA world cups and in Concacaf, our local leagues have to step up to the plate like MLS in the USA has stepped to the plate in the development of information collection and dissemination. \r\nThe MLS website is excellent and truly allows the players,technical managers, administrators, clubs seeking players, players agents and other interested parties to see exactly where the players stand on each and every statistic that is measured in the EPL and other leagues of that ilk. 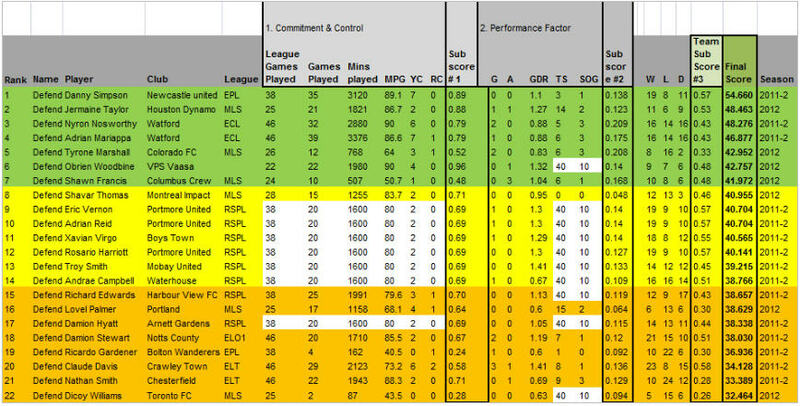 \r\nWhat we actually see when we look at the data is that even in the MLS not to mention the RSPL our best players are not even close to the performance based on statistics that the top players in La Liga, EPL, Bundesliga, Serie A produce. In those leagues we see a consistent trend of top players in the striker and midfielder position having a high strike rate of goal producing event (GPE) with each game when measured over an entire season, whether assists or goals or combination thereof, at one GPE per game throughout the entire season. \r\nLooking at number of games played relative to number of games played in the league for the season, top players like Messi, Ronaldo and Evra each representing the three position types are playing if not every game they miss only one game for the entire season, of our 64 players in this sample only Obrien Woodbine and Jason Morrison are at that level of durability and Joel Senior at the local level with 36 of 38 games played in the RSPL (Senior being the most complete data available at the RSPL level). Thus the most critical piece of being able to play at the professional level; the commitment to the job showing up every day and playing full minutes seems to be missing in the local game. It is not even measured, I am sure many of our star players are probably rested for key games thus when they get to the real professional leagues they have not developed the mental work habits to play every single game at a high level, they have not developed the desire and mental skills necessary to convince all pertinent parties that they must be on the field at all times in all games as that is what is required for the team to win. At professional clubs where the “star player cushy treatment is missing for our players”, this means they must rapidly adapt and adjust in order to exert the necessary physical and mental effort in practice and in games and strengthen their desire and will to convince all parties, players, coaches, managers that they must play for the success of the team. \r\nThe goal differential ratio in the big leagues for the best team suggest that we are not even playing the same game in the second tier and third tier leagues relative to the EPL, La Liga and Serie A, looking at the first and second place teams like Barcelona, Real Madrid, Manchester United, Manchester City in the top leagues all these teams have “high goals for” number versus very low “goals against” number which results in a significant goal differential ratios while for roughly the same number of games MLS, RSPL etcetera the numbers of goals scored for versus against and the GDR ratios are very low for the top teams in these leagues. \r\nOur best local player in the RSPL is scoring at a GPE of .36 per game, while Messi is scoring at 1.75 GPE’s per game, Ronaldo at 1.57 per game, Van Persie at 1.01 per game and they are playing against the best competition week in and week out and not missing games. Top local teams should be producing forwards and midfielders that can produce at that rate or strive to get above .50 GPE for the best players in what is a third tier non-professional league, but they have never either had such an expectation set or measured themselves in this way or benchmarked other leagues to see what it takes at that top level to really succeed. Thus we see our “great” talent barely making the grade in second tier leagues and very few making it as solid contributors in top tier leagues as the necessary knowledge of performance required to thrive or in this case merely to survive in these leagues has not been cultivated in our local leagues and thus is totally missing when our players arrive and need to survive in a professional setup. \r\nHere is the opportunity to raise the bar in one area, that is collection of data and measurement of performance so RSPL players can truly understand what they are doing and measure themselves somewhat against the competition, basically creating a more level playing field so all aspirants can feel, “if I perform at this level then I must get called for national duty or at least attract the attention of a professional team scout” otherwise we are destroying the very base of the system we are trying to build. Some people think the RSPL is not relevant, but it is probably the best thing we have got going in local football so we must make every effort to build it as much as possible as it is the battleground to develop and improve the football industry for export of players which should be our goal for the foreseeable future as we cannot sustain a true professional league when per capita is income is less than $5000.00 US per person. \r\nIt is nice to see certain young players getting called for national duty but the bottom line is they must produce in the local league on a consistent basis to get called. We would never see a situation where a sprinter like Dexter Lee would get called to represent Jamaica in the Olympics ahead of Ashmeade, Young or Weir who have produced and demonstrated superior results especially at critical times like at National Trials. The RSPL should be our National Trials for those players in Jamaica, those who rise to the top looking at productivity, durability and consistency should get picked, that levels the playing field for all and makes it clear what the standards are and what to play for. No matter how great anyone thinks his talent is, talent is great, but application of talent to produce results in competition should be the only standard. \r\nAt the end of the day we want all our players wherever they are to truly believe and strive for the following words by Longfellow. Before I send this to the JFF, I will have to email a copy to our good friend Mugabe. Because surely, this is one Jamaican who is not always drunk and high on ganja. \r\n...well, maybe I shouldn\'t do that. Just yet. Seeking a way to keep the hype separate from the reality so we can quickly isolate and identify the best of the best. I admire the...the...depth of scholarly investigation and research this post represents. Chuss mi, since leaving grad school, I am elated that you did not even consider calling me to help type this stuff! \r\nStats are useful and I will see how we can use this to our benefit. Haha I hear you, Cbar man always have to look to the mountaintop on some things. Thanks, looking for the good feedback, now that it is posted after Nuff time spent, I can already see the weaknesses and how it can be improved. I used arithmetic averages which can be a little unbalanced to certain series of numbers, so next run I will shoot for geometric averages which will eliminate any bias in any series of numbers. \nCopied you on some e-mails! Thanks Karl, will check that out. I will have to take a closer look when I have time. I have not looked at such heavy stuff since...erm...since...ok, I can\'t remember when. Very nice work! It is a good management tool a coach can use to justify certain decisions, but it\'s really a very poor tool for picking a world cup team. Good point, think of it like going it for a job, like Operations Manager for say Red Stripe, what you are doing is trying to winnow down the competition so you get the best applicants, first thing is you need someone with an engineering degree, mechanical would be great, ie would be ok, MBA would be great, experience in beverage operation would be critical, proven results at multiple locations for significant periods essential, awards a plus. \r\nSame with defensive midfielder, proven experience in tough foreign league preferably Epl, la liga or serie a,if not championship, mls or Scandinavian leagues, proven defender, proven interceptor and high work rate, durable as evidenced in number of games played per season and number of games started. Proven goal scorer and attacking threat and excellent passer of the ball. Team player and leadership skills essential! \r\nHow many people could fit that description, if we were to do that for each position, we wouldn\'t see some choices of babies out of cribs playing in critical games or unproven players been put in tough positions where they have no business being, but as you say, good tool to isolate the best in the crowd, once that is done then it is all about chemistry and desire. \nSame with defensive midfielder, proven experience in tough foreign league preferably Epl, la liga or serie a,if not championship, mls or Scandinavian leagues, proven defender, proven interceptor and high work rate, durable as evidenced in number of games played per season and number of games started. Proven goal scorer and attacking threat and excellent passer of the ball. Team player and leadership skills essential! \nHow many people could fit that description, if we were to do that for each position, we wouldn\'t see some choices of babies out of cribs playing in critical games or unproven players been put in tough positions where they have no business being, but as you say, good tool to isolate the best in the crowd, once that is done then it is all about chemistry and desire. \n...I hope that now we all have gotten the point of your series of articles and the value of same (following the suggested way forward) has sunk in! Interesting read; One question come in my head. Which country or countries of similar population to Jamaica would you compare against to judge just how good, or behind Jamaica\'s national football team is in the footballing world? I guess my thought isn\'t about comparing to others our size as that is not good enough to consistently make the World Cup or create a program that churns out multimillion dollar ballers at every position. However if I were to compare us to another country about our size population wise that has overachieved it would be Uruguay, they have won two world cups and as you know illegally got to the semifinals at the last cup, but they are ahead of us by many many miles overall as a football machine. Population does not enter the picture...reference our Track and Field athletes! ...it is only about quality - level of performance(s)! This is a quote from Chinese military strategist Sun Tzu in the Art of War. This is probably one of the first mentions of the fundamentals behind benchmarking theory in the written history of man. Sun Tzu wrote this treatise some 2400 years ago. Applying this quote to the current Jamaican Football Industry exposes one of the inherent weaknesses of our football culture; that is the lack of internal and external benchmarking of football practice and culture. We neither know who we are nor do we know our competition as we are not consistently measuring ourselves on core criteria that the other leagues do nor are we looking at how others perform in these key statistics. If we don’t set the standard based on benchmarking the best both internally and externally we will forever be “at risk” in the heat of competition. In our case the competition is the FIFA world cup qualifying and Concacaf club championship competition. The one area that this article will focus on is the gathering and dissemination of performance statistics equivalent to what other top leagues such as La Liga, EPL, Serie A as well as other top second tier leagues like the Championship and MLS that consistently gather and publish fundamental information on a weekly basis on what the players have done in each new round of competition. This creates the basis for measurement of performance and benchmarking that drives improvement on every level. Simple statistics such as assists, games played per player, minutes played within the league season by player, shots taken and shots on goal are all missing from the top Jamaican league the RSPL. What is necessary is a weekly cumulative update on this information so players know exactly where they stand. If the players are not driven by competition then shame is also a good motivating factor when performance of duty is measured and the information disseminated to all relevant parties. Thus currently our players, technical managers, club administrators, fans and other interested partieshave no opportunity to measure player performance and development through the season in key performance areas. Performance measurements in Track and field and Cricket are a fundamental part of the selection process; the times and scores for every track meet and cricket match held in Jamaica are typically readily available and well understood throughout the greater sports community in Jamaica, this certainly is not the case in football. 1. These rankings are based on the main everyday job that players have, that of the their club’s participation in their main league competition, it does not look at other games or other cup competitions, thus players in clubs within the EPL, the statistics are strictly for those games that constitute the EPL season, no FA cup games, or other type of games are included. a. This levels the playing field for all the clubs across the various leagues. b. Levels the playing field for all players within the club. The players’ main job is to play as much as possible in all league games. Consistently making the first eleven or at the very least being in the active substitute rotation. The only way to do that is being productive with each opportunity that the player receives when he makes it onto the field in a league match. These are the main criteria points that the players are measured on when compensation and contract negotiations come around, consistency, productivity and durability. 2. Injury time is not backed out in the assessment of player participation one of the subcategories of the ranking, the players jobs is to be indispensable to the team and a wounded warrior cannot impact the battle on the field even though he is paid while he is wounded. Durability is a highly desired trait in this ranking, thus a player like Rudolph “Ruddy” Austin who was out for a few games at SK Brann this season, his bottom line number would be somewhat affected by missing those games but there are many other performance measurement areas that also impact on the overall ranking. 3. The players in the ranking do not constitute a comprehensive list of all players that are eligible to represent Jamaica however this list is quite wide and covers a lot of ground in that respect. 4. Data in this ranking covers the 2011-12 season and or the 2012 season, the data end point is 8.30.2012. The data from the start of the English and some European seasons since August 2012 are not included in these statistics as those have just started in the past two weeks. Also all European competition except those wholly in 2012 like the Norwegian Tippeliagen as well as the US MLS are not included in this ranking. 5. No goal keeper information is in this first issue of the ranking. 6. Inadequate data on certain players has led to the omission of some of their data from the ranking, thus is the case of both Errol Stevens and Kavin Bryan and their stint in Vietnam. The one exception was Jeremy Lynch where I was able to combine the data from the RSPL and the U21 games with the RSPL total season as the denominator to get one score. His information was the only under 21 player where most of the core information was available. 7. Certain assumptions had to be made on the Jamaican players to get a final score and rank due to the inadequate measurement and dissemination of performance data, many to the detriment of local players such as Jermaine Anderson, Michael Campbell and Jermaine Hue. In each case I am certain that these players had more than one assist in the games played in the RSPL season and they probably also played more games than the given credit within the base assumption where the data was unavailable. Therefore with no hard information in the assist area, their performance in this area show no assists, so in that category they receive no score. Information on games played and minutes played also led to assumptions driven more by the average of the total table outside the RSPL, thus all RSPL players without games played, assists, minutes played and shot accuracy information will all be filled with data at the 75% performance level of the average of the entire group, except in the case of minutes played per game where a higher number is issued that the average of 73.35 minutes per game for the non –RSPL group based on the data. All assumptions made are consistent across leagues and players from an impact standpoint and are highlighted in white blocks in the tables. 8. Assumptions also had to be made on shots taken and shots on goal numbers for other second tier Eurasian leagues like the Norwegian Tippeliagen, the Finnish Veikkausliga and the Turkish Super Lig, the same assumptions hold sway as were made for the RSPL as well basically a 25% shot on goal ratio versus shots taken. 9. Acronyms and abbreviations in the table; MPG-minutes per game, YC & RC yellow and red cards, GDR- goal differential ratio that is goals for divided by goals against, TS – Total shots taken, SOG – shots on goal, W,L,D means team wins, losses and draws for the season or season to date. The colours in the table basically break each position group into three ranks. That is top tier in green, middle tier in yellow and bottom tier in orange. 10. Look at the article “Raising the Bar III” in the Reggae Boyz Supporterz football forum for more discussion on assumptions across the leagues and other points where there may be questions. NB: Your feedback is greatly appreciated and your comments shall be an important input on review taken before the next publication is undertaken. What has been learned from this process is we truly have some fundamental flaws that need to be addressed immediately if our hope is that Jamaica can be a consistent player at FIFA world cups and in Concacaf, our local leagues have to step up to the plate like MLS in the USA has stepped to the plate in the development of information collection and dissemination. The MLS website is excellent and truly allows the players,technical managers, administrators, clubs seeking players, players agents and other interested parties to see exactly where the players stand on each and every statistic that is measured in the EPL and other leagues of that ilk. What we actually see when we look at the data is that even in the MLS not to mention the RSPL our best players are not even close to the performance based on statistics that the top players in La Liga, EPL, Bundesliga, Serie A produce. In those leagues we see a consistent trend of top players in the striker and midfielder position having a high strike rate of goal producing event (GPE) with each game when measured over an entire season, whether assists or goals or combination thereof, at one GPE per game throughout the entire season. Looking at number of games played relative to number of games played in the league for the season, top players like Messi, Ronaldo and Evra each representing the three position types are playing if not every game they miss only one game for the entire season, of our 64 players in this sample only Obrien Woodbine and Jason Morrison are at that level of durability and Joel Senior at the local level with 36 of 38 games played in the RSPL (Senior being the most complete data available at the RSPL level). Thus the most critical piece of being able to play at the professional level; the commitment to the job showing up every day and playing full minutes seems to be missing in the local game. It is not even measured, I am sure many of our star players are probably rested for key games thus when they get to the real professional leagues they have not developed the mental work habits to play every single game at a high level, they have not developed the desire and mental skills necessary to convince all pertinent parties that they must be on the field at all times in all games as that is what is required for the team to win. At professional clubs where the “star player cushy treatment is missing for our players”, this means they must rapidly adapt and adjust in order to exert the necessary physical and mental effort in practice and in games and strengthen their desire and will to convince all parties, players, coaches, managers that they must play for the success of the team. The goal differential ratio in the big leagues for the best team suggest that we are not even playing the same game in the second tier and third tier leagues relative to the EPL, La Liga and Serie A, looking at the first and second place teams like Barcelona, Real Madrid, Manchester United, Manchester City in the top leagues all these teams have “high goals for” number versus very low “goals against” number which results in a significant goal differential ratios while for roughly the same number of games MLS, RSPL etcetera the numbers of goals scored for versus against and the GDR ratios are very low for the top teams in these leagues. Our best local player in the RSPL is scoring at a GPE of .36 per game, while Messi is scoring at 1.75 GPE’s per game, Ronaldo at 1.57 per game, Van Persie at 1.01 per game and they are playing against the best competition week in and week out and not missing games. Top local teams should be producing forwards and midfielders that can produce at that rate or strive to get above .50 GPE for the best players in what is a third tier non-professional league, but they have never either had such an expectation set or measured themselves in this way or benchmarked other leagues to see what it takes at that top level to really succeed. Thus we see our “great” talent barely making the grade in second tier leagues and very few making it as solid contributors in top tier leagues as the necessary knowledge of performance required to thrive or in this case merely to survive in these leagues has not been cultivated in our local leagues and thus is totally missing when our players arrive and need to survive in a professional setup. Here is the opportunity to raise the bar in one area, that is collection of data and measurement of performance so RSPL players can truly understand what they are doing and measure themselves somewhat against the competition, basically creating a more level playing field so all aspirants can feel, “if I perform at this level then I must get called for national duty or at least attract the attention of a professional team scout” otherwise we are destroying the very base of the system we are trying to build. Some people think the RSPL is not relevant, but it is probably the best thing we have got going in local football so we must make every effort to build it as much as possible as it is the battleground to develop and improve the football industry for export of players which should be our goal for the foreseeable future as we cannot sustain a true professional league when per capita is income is less than $5000.00 US per person. It is nice to see certain young players getting called for national duty but the bottom line is they must produce in the local league on a consistent basis to get called. We would never see a situation where a sprinter like Dexter Lee would get called to represent Jamaica in the Olympics ahead of Ashmeade, Young or Weir who have produced and demonstrated superior results especially at critical times like at National Trials. The RSPL should be our National Trials for those players in Jamaica, those who rise to the top looking at productivity, durability and consistency should get picked, that levels the playing field for all and makes it clear what the standards are and what to play for. No matter how great anyone thinks his talent is, talent is great, but application of talent to produce results in competition should be the only standard. At the end of the day we want all our players wherever they are to truly believe and strive for the following words by Longfellow.